A portion of U.S. 321 Business/Main Street/U.S. 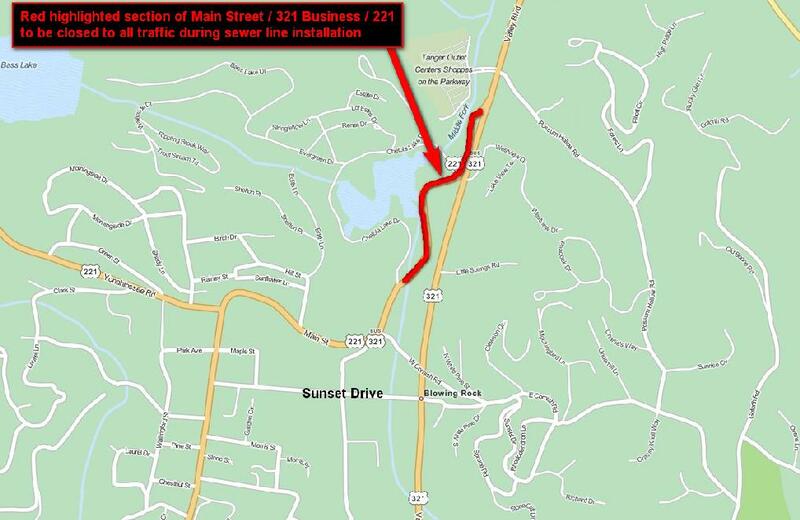 221 from the traffic signal near Cliff Dwellers Inn to north of the entrance to Chetola in Blowing Rock will close temporarily next week for a sewer line installation. The closure will begin Monday at 6 a.m. A signed detour will direct motorists to use Sunset Drive to get around the road closure. The project contractor, Maymead Inc., will have the closure removed by Friday to avoid any potential impacts to weekend travelers. The sewer line installation is necessary for crews to continue making progress on the U.S. 321 widening project. The new sewer line will be roughly 12 feet deep and run down the middle of the two-lane section of U.S. 321 Business. For more information, call the project information line at 828-964-3260. The information line is available Monday through Friday from 8 a.m. to 5 p.m.